A false-color image of the anomalous gamma-ray emission from the central region of the Milky Way galaxy; this emission is suspected of coming from dark matter annihilation. In this image, the emission from conventional sources has been subtracted from the total. The region covers roughly five degrees; the brightest emission is colored red and faintest blue. Credit: Daylan et al. We live in a dramatic epoch of astrophysics. Breakthrough discoveries like exoplanets, gravitational waves from merging black holes, or cosmic acceleration seem to arrive every decade, or even more often. But perhaps no discovery was more unexpected, mysterious, and challenging to our grasp of the "known universe" than the recognition that the vast majority of matter in the universe cannot be directly seen. This matter is dubbed "dark matter," and its nature is unknown. According to the latest results from the Planck satellite, a mere 4.9% of the universe is made of ordinary matter (that is, matter composed of atoms or their constituents). The rest is dark matter, and it has been firmly detected via its gravitational influence on stars and other normal matter. Dark energy is a separate constituent. Understanding this ubiquitous yet mysterious substance is a prime goal of modern astrophysics. Some astronomers have speculated that dark matter might have another property besides gravity in common with ordinary matter: It might come in two flavors, matter and anti-matter, that annihilate and emit high energy radiation when coming into contact. The leading class of particles in this category are called weakly interacting massive particles (WIMPS). If dark matter annihilation does occur, the range of options for the theoretical nature of dark matter would be considerably narrowed. CfA astronomer Doug Finkbeiner and a team of colleagues claim to have identified just such a signature of dark matter annihilation. They studied the spatial distribution of gamma-ray emission in the Milky Way, in particular gamma-ray emission from the Galactic Center region. This region is both relatively nearby and has a high matter density (and nominally a high dark matter density as well). 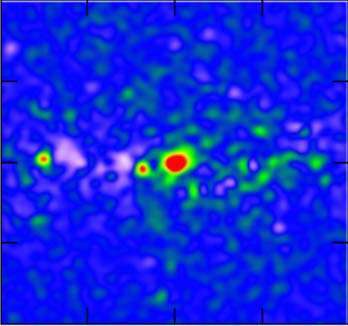 If dark matter annihilation occurred, the location would be expected to be bright in gamma-rays. Indeed, a large gamma-ray signature has been seen from the area that extends over hundreds of light-years (there is also fainter emission extending outward for thousands of light-years). There are other possible explanations, however, most notably that the gamma-rays result from a large population of rapidly spinning pulsars, the nuclear ashes of some supernovae. The scientists revisited the set of previously published gamma-ray observations, applying careful new data reduction methods in order to constrain more precisely the location of the emission, and they did so for each of the several observed energy regimes of the gamma-ray emission. Pulsars have a distinctive spatial distribution: they are located where stars are found, predominantly in the plane of the galaxy. The team was able to show with high significance that the distribution of gamma-ray emission is in good agreement with the predictions of simple annihilating dark matter models, but less likely to be consistent with a pulsar explanation. Their result, if confirmed, would be an impressive breakthrough in the understanding of the nature of dark matter, the dominant constituent of the cosmos. There is a lot going on in the central core of the Milky Way. Before exotic new particles are proposed, the activity of the SGR A* black hole must be considered. "Some astronomers have SPECULATED that dark matter might ...It might come in two flavors, matter and antimatter, that might annihilate and emit high energy radiation when into contact"
It is KNOWN and NOT SPECULATED that chance accumulated (patches- clouds, nebula, stars, clusters etc.) of ordinary matter and antimatter exist in the galaxies including the Milky Way. If the Big Bang fantasy is ignored and a dialectical evolution of the universe is considered, then the occurrence of gamma ray emission through the chance annihilation of matter and antimatter in the galaxies needs no "SPECULATION" at all and not even the cosmic monsters "dark matter", "Black holes" etc. So why don't we do some historical tracking of Zwicky's proposals for the existence of DM. Zwicky observes that the Radial Arms of Spiral galaxies rotated their central hubs at rates between 100-300 km/s, this in comparison to the far slower rates of outer orbital stars of giant Ellipticals at rates of around 2 km/s. Consequently Zwicky thinks there must countervailing forces of gravity located in envelopes surrounding Spiral galaxies that prevents the Radial Arms from imploding into the Central Hubs. From this, he imagines there is gravity being produced by enveloping concentrations of mass that exceeds the Visible Matter of the Spiral disc by a ratio of about 5:1. This current study places the DM mass inside the Spiral Arms. Wouldn't it just be so nice if these neophyte geniuses, who attach titles of ASTROPHYSICISTS to themselves, would simply get their acts put together & make up their minds as to where we are to look for their cosmic fairy dust? "We live in a dramatic epoch of astrophysics. Breakthrough discoveries like exoplanets, gravity waves from merging black holes, or cosmic acceleration seem to arrive every decade, or even more often"
The usual metaphysical mantras that have nothing to do with reality. In fact we are back again in dark age of science because the same reason. There is no way to be detected gravitational waves from the mathemathical objects like black holes, that does not exist in phisical reality. All waves propagate in a physical environment. Sound, water waves, electromagnetic waves. In fact they are part of it and can not be cosidered separate from it. They represent periodic damped oscillations in the structure of this environment begining after the energy impact and declining due to scattering and its resistance. The electromagnetic waves are vibtaritions (periodic oscilations) in the the physical structure of vacuum of space that scater and fade with traveled distance. Dark matter is not a clump of stuff that travels with the matter. Dark matter fills the space unoccupied by particles of matter and is displaced by the particles of matter which exist in it and move through it. Dark matter strongly interacts with matter. Dark matter is displaced by matter. "the emerging picture of the dark matter halo of the Milky Way is dominantly lopsided in nature." The Milky Way's halo is not a clump of dark matter traveling along with the Milky Way. The Milky Way's halo is lopsided due to the matter in the Milky Way moving through and displacing the dark matter, analogous to a submarine moving through and displacing the water. What physicists mistake for the density of the dark matter is actually the state of displacement of the dark matter. They fail to realize is the state of displacement of the dark matter is curved spacetime. 'It might come in two flavors, matter and anti-matter, that.....' Just my layman's point of view but if, and I repeat IF, DM consists of ordinary matter in some special circumstance then it will obey QM and have anti-partners. If DM consists of yet undiscovered matter (particles) then to fit in with the St.QM model it must also anti-partner principle so no surprise. But if it doesn't......Oh dear me! I can imagine no more damning indictment of the trolls on physorg than that anyone should give a person who posts the link to the actual scholarly paper less than a 5. We are beset by trolls. This is silliness. It's unconscionable. Phys1 should have gotten nothing but 5s for this unless someone is lying. There is nowhere to hide, and nowhere to run. If you don't like the scholarly papers go post somewhere else. Such people are obviously incapable of comprehending the scholarly papers because they are devoted to teh stupid, which burns. It's not about hurt feelings. It's about teh stupid posting on teh science site. I really have to wonder about people who think they can vote against reality. This is already published on arxiv on Feb. 2014. Is there anything new? Well, you just got a 1 from me simply because your post has nothing to do with science. You instead, launched into another of the Rant Brigade's favorite routines of name calling with the "troll" word, then you wonder why the ones on whom you use that word won't give aficionado status to your favorite class of Posters, you know, like Phys 1 whose posting history is filled with all manner of of foul mouthed profanity, he should apologize. I have a recurring dream where I'm in a bar and overhear someone saying something that identifies them as one of the regular trolls, like benni, and I follow them out into a dark alley and beat some respect into their empty heads. But it's physorg's fault. ANY site with this content would be trolled and spammed. Physorg allows and seems to encourage it. Ultimately we have to get mad and stop posting anything so that the comments are totally discredited. All but the trolls can realize if the comments are nothing but looney spew. They're so crazy that they wouldn't entice even the feeble minded that aren't already converted to use trolling as a pitiful attempt to give some meaning to their pitiful lives. This is already published on arxiv...Is there anything new? Many scientists upload an early version to arxiv before publishing in a journal (that's why arxiv is called a 'preprint' server) . This makes research papers available to everyone. The paper that is eventually published in a peer reviewed journal (which can take several months to more than a year from first submission) may differ minimally (or a lot, depending on additional work added until then or feedback from peer reviewers) from the one uploaded to arxiv. Note: The article in the journal HAS to differ from the arxiv upload (if ever so slightly) because once you publish in a journal the paper is no longer yours. It then belongs to Springer, Elsevier (in this case) or other publishing firms. And one prerequisite for being allowed to publish in a journal is that you cannot publish something that is already published somewhere else - even if it is just an upload to arxiv (because of copyright). ....and here you are Schneib, chief the complainer about "trolls". You want credibility, give chileastro a 1, I dare you. Not one word in his post about the subject matter or anything else about science, only his threats to physically confront & commit acts of violence against those with whom you in the Rant Brigade disagree. Oh, I get it Schneib, you intend to take the high road instead & just not vote on his post? You're silence is your consent. Remember Schneib, rate posters on science content? Let's see if you can practice the narrative. Let's see what your twin (antialias_physorg) does as well. coexistance of matter and anti-matter stars, etc. has been speculated here. Just a tiny question... Suppose an antimatter supermassive black hole meets a normal matter supermassive black hole?? I kinda believe that this event would be quite violent. And this is the problem with the peer-reviewed literature. The source of the real data and interpretation isn't public data- it's something that's driven by profit and that is a tick sucking upon science. The tick has grown larger than the cow it's sucking on. I'm all in favor of peer review, and all in favor of there being scholarly journals that publish peer-reviewed articles. But this shell game of making three minor edits in order to ensure that these publications get their money is destroying the integrity of science. ..and here you are Schneib, chief the complainer about "trolls". You want credibility, give chileastro a 1, I dare you. Not one word in his post about the subject matter or anything else about science, only his threats to physically confront & commit acts of violence against those with whom you in the Rant Brigade disagree. .......and you want the forum to believe the drivel you just posted right above this, that you're here for the science? But consenting to violence against Posters with whom you disagree. So tell us, what really does this make you? The source data of non-peer reviewed articles (like on arxiv) isn't public data, either. Even if it were public data nobody could do anything with it since it's all in highly specialized formats. If you actually want to do research that requires this data there's nothing stopping you from asking to access to it. In the case of non-industrially usable data (like astronomically data) this may even be possible (I've done this in the past for earthquake data and had no trouble getting it). Though you should be prepared to have a hefty server farm and some humongous hard drives at your disposal...as well as weeks/months of time to dig through specifications to make any sense of it. it's something that's driven by profit and that is a tick sucking upon science. The political decision in almost all countries over the past 3 deacades has been "science costs too much". So for most research you have no choice but to seek the cooperation of industrial partners for part of your funding. Of course these partners are unwilling to share the knowledge gain - which they invested money and manpower in - 'for free' with others ... especially their competitors. I find this quite understandable. I wish we could go back to the days of all-government-funded science, but that doesn't look likely. There's just not enough people who make this a priority issue. Other issues are more important to politicians and voters (getting shiny new playthings for their militaries and whatnot). OK, I think you're missing a few things here. Publications are done by publication companies. Springer, Elsevier, et al. These don't care about science. They are businesses. They are like sports channels on TV (which don't care about sports but on the revenue generated with it). For their business case to work they need copyright on the articles. This doesn't mean that what is in the arxiv papers is wrong. Papers on arxiv that get subsequently published in journals are for the overwhelming part good quality. There is mostly no loss to the casual reader reading the arxiv paper vs. the journal paper. Edits are made for VALID reasons. This can be as simple as editing for legibility or adding a few more references that were missed. But it CAN be that reviewers point out flaws which lead to reworking parts. It CAN happen that in the intervening months until publication new data changes the results (slightly. A drastic change is hugely unlikely) or that additional conclusions can be drawn. If you feel that this makes the arxiv paper useless just wait until the next arxiv paper by the researcher. Papers build on one another. The changes will be mentioned in the "previous work" section of the next one. I don't see how any of this 'destroys the integrity of science'. Sorry for the wall of text, but there is just so much misunderstanding about what the peer review process is and what it isn't. 3) Number of readers of journals are MUCH lower than newspapers - hence the hefty pricetag on journal subscriptions. Wow. I'll have to take some time to read that; I don't have time now, but I should later today. Thanks for the categorical reply! OK, AA, first of all you broke my first sentence apart, and then answered each half as if it were a stand-alone thought. As a result you misinterpreted what I meant. I wasn't talking about the data of the underlying research; I was talking about the ability of the general public to evaluate the interpretation of the data, and the reasoning leading to the conclusions the authors-- scientists-- propound, and decrying the fact that this reasoning and interpretation and these conclusions are copyrighted and held behind paywalls by someone other than the scientists themselves. The money the publishers makes doesn't go to the scientists, and doesn't go to the enterprise of science. That's why I call the publishers ticks. I have no problem with the publishers recouping their expenses for overseeing (and even providing) peer review, nor with them making a reasonable profit doing so. However, they don't make a reasonable profit-- and yes I checked, and you can too, and Elsevier are making 40%. Google it up. That's a billion dollars a year. And not a cent of it goes to the scientists who actually did the work, and not a cent of it goes to fund the research. They're ticks. And *that* is what is destroying the integrity of science. I have no argument with your points about the benefits of a peer-reviewed journal, nor did I or do I have any lack of understanding about what peer review is and how it works. I'm not suggesting abolishing them, nor am I suggesting they shouldn't make a *reasonable* profit, but I think that they could be forced to disgorge some of their unreasonable profits for the benefit of the creators of their content, and for the advancement of science itself, and they would smell a lot better to me in that case. And yes, I think that abusive profits and blatant unbridled self-interest affect most peoples' perceptions of science. Now, with regard to the general voters rejecting spending on science and concentrating on shiny new military objects, this is "bread and circuses" to me. Short sighted, ignorant, and based upon fundamentalist religion and sublimation of aggressive tendencies that are curbed by the laws in civil society into aggressive foreign policy. That's why many upload also to arxiv - unless a research partner (company) doesn't allow them to (for stated reasons). The reasoning/interpretation is no less present in the arxiv papers than it is in journal papers. You lose nothing reading the preprint except the added quality provided by peer review. That's why I call the publishers ticks. Agreed. But I don't see how to change this unless someone coughs up money to finance a standard review system without any interest themselves. I could only see governments/international organisations do that, and I see no indication that any of them are about to. Sorta. It's like with the mentioned sports TV channels. Does any money they make go to sports teams? No. Do the teams benefit? Yes. Exposure increases their 'market value' and hence their salaries. In science terms peer review does increase the quality of an article (sometimes drastically) and the 'market value' (impact factor points) of the researcher (i.e. the chance of them getting tenure) goes up. So there is some benefit or researchers wouldn't publish at all in journals. this is "bread and circuses" to me. Short sighted, ignorant, and based upon fundamentalist religion and sublimation of aggressive tendencies that are curbed by the laws in civil society into aggressive foreign policy. No argument here. But that's just the world we live in. Most people look to tomorrow. Not next year (much less next decade/century). Politicians' horizons extend until the next election. The fallout of good science is usually beyond that so voters don't benefit personally in a timeframe that would affect their vote to the politicians' favor. Result: "science funding ain't worth it"
A dictator's horizon might extend long enough but they tend to not be beholden to voters at all - so they benefit even less by implementing good science policies. I think we substantially agree. ......and this would include your advocacy for violence against Posters who disagree with anything you run off at the mouth about? With your advocacy for committing acts of violence against anyone who disagrees with you, you're no less as zany a troll as Zwicky ever was in his lifetime with his advocacy for the weird funny farm pseudo-science of DM cosmic fairy dust. You do know who Zwicky is, right? Yeah, the trolling nutjob who would create outbursts of name calling innuendo right in the middle of other scientists symposiums.